In our shop you will find a variety of water pipes from Egypt, Germany and China. Handla smart och spara pengar . Köp över 500, frakt inom Malmö är gratis. نحن شركة مهتمة في استيراد الشيشه واكسسوارات الشيشه و الفحم والزجاج والبرابيش وغيرها التي تلبي احتياجات المستهلك. هدفنا الوصول إلى أكبر عدد ممكن من المستهلكين عشاق الارجيلة والشيشه . نعمل على توفير السلع التي تتناسب مع كافه الاذواق وعلى كافه مستويات الجودة والدقه في خدمة العملاء و التواصل مع عملائنا ومعرفة احتياجاتهم ومتطلباتهم. لتحقيق هدفنا للوصول إلى المستهلك في السويد على وجه الخصوص واوروبا، نعمل على مدى 10 ساعات في اليوم في مالمو. في أفضل طريقة مخصصة لبيع مجموعة واسعة من الملحقات والاكسسوارات التي تمكن العملاء من اختيار ما يحتاجه بطريقة سلسة وسهلة. We are a company that works with imports of water pipes and its accessories. Coal, bottles, hoses and even more things. Our goal is to capture the interests of our dear customers, therefore we offer high quality goods at a great price. We love when you are satisfied! We are working to fully deliver all our products and we adapt ourselves to the customer. We listen to our customers' wishes and try to fulfill them as much as possible. In order to be available all the time, we are available every day at our store in Malmö. You will find the shop open 10 hours. In our shop you will find everything you want in one place. We sell to regular but also wholesale price. You can also take advantage of different offers. We have several brands in terms of water pipes, accessories and coal. Welcome to be inspired ! Made in Egypt, Khalil Mamoun, made of stainless steel, length 90cm. With 2 holes engraved on hand. Made in Egypt, Khalil Mamoun, made of stainless steel, length 90cm. لتعديل هذا القسم، انتقل إلى الصفحات وابحث عن صفحة المتجر، ثم انقر على تعديل. HS001 Chinese shisha, small size, there are four colors, net weight 1250 grams, made of metal resistant to rust. 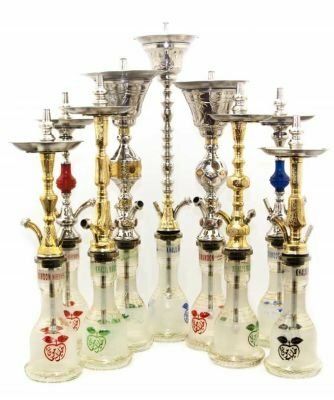 Chinese shisha, medium size, four colors, net weight 1500 g, made of metal resistant. HS005 Chinese shisha, small size, there are four colors, net weight 1250 grams, made of metal resistant to rust. Chinese shisha, large size, there are 1 color, net weight 2800 g, made of metal resistant. Chinese shisha, large size, there are three colors, net weight 2800 g, made of metal resistant. Chinese shisha, large size, there are colors, net weight 2500 to 1800 grams, made of vineyard metal. Chinese shisha, large size, and there are colors, net weight 1200 grams, made of vine metal. Chinese shisha, large size, and there is black, net weight 1200 grams, made of vineyard metal. Chinese shisha, large size, there is the number of colors, the net weight 4500 to 5000 g, made from inside copper metal and abroad resistant to corrosion.